GRAFORD, TX -- The legendary Brazos River has cut a path through Texas for centuries, but when this grand river met the Palo Pinto Hills, just 75 miles west of Fort Worth, a geological wonder was carved through limestone and cedar. The cliffs were formed ages ago and in the 1940s the river was dammed to form a huge lake nestled within the dramatic and craggy North Texas hill country. The Morris Sheppard Dam created Possum Kingdom Lake -- the most beautiful lake in the Lone Star State. It was only a matter of time when the golf boom hit and in 1986 The Cliffs at Possum Kingdom was created by golf-course designers Bruce Devlin and Robert von Hagge. The Cliffs will dare you from 6,808 yards at par 72 as you wind through rolling terrain, dodge whitetail deer, hit over rock outcroppings and fairways lined with tall mounds and sand bunkers. No less than six times you will be asked to fly the ball over the cedars and limestone through ravines or canyons that will easily gobble up any mis-hits. And several times you will be asked to clear a stacked-limestone barrier that holds a green just hugging a ridge top. Once you have reached the smooth-rolling bent grass you might be faced with some big breaks on sloping greens. For certain you will have innumerable photo opportunities that will take away your golf concentration. For a novice these cliffs, canyons and ridges can present a scary carry. But if you pick the right tee box for your game and just concentrate on the swing, The Cliffs won't defeat you. "We've had several writers come in here and talk about how tough this golf course is," said Darrell Eshelman, The Cliffs' PGA Professional. "But it just isn't that difficult." No. 3 is an all-carry par-3 hole, 196 yards from the back tees. If you are short of the stacked rock putting surface there's no recovery. The very next hole has another ravine carry to the green on a 548-yard par-5. No. 8 is almost a horseshoe-shaped dogleg right, a par-5 at 555 yards. The second shot is a long carry over a deep ravine. No. 9 is the signature hole with its Pebble Beach-like view of the water and cliffs. It's a 195-yard par-3 with a 150-foot cliff drop to the lake far below. But it's not the only great par-3 on this layout. When you get to the 15th, you face a 162-yard downhill shot with wilderness and a cliff wall on the left and a lake on the right. The green is long and narrow and looks like a postage stamp from the perch above. Because you are hitting down to an enclosed hole in the rocky terrain, the wind can swirl. The Cliffs at Possum Kingdom may have the most spectacular terrain of any golf course in Texas. If you come here thinking about the flatness and vastness of the Staked Plains or typical West Texas nothingness, you will be stunned. Many people think once you leave Fort Worth heading west you won't see anything but flat land before you reach the Caprock. Possum Kingdom country has loads of Texas and cattle history. Nearby Palo Pinto County was the home base for a time of Oliver Loving and Charles Goodnight, the two pioneering cattlemen who inspired Texan Larry McMurtry's Pulitzer Prize-winning novel Lonesome Dove. The Goodnight-Loving Trail followed through the old west from North Texas to Fort Sumner, N.M., where they sold most of the cattle, then on to Denver. The little town of Palo Pinto was the home of many of the great Texas Cattle drives. The courthouse is currently under restoration and The Palo Pinto Cafe might remind you of the cafe in the movie "Fried Green Tomatoes". There are several antique shops and art galleries located on the historic town square. Those driving from West Texas should stop in Breckenridge, a Texas High School football hotbed, and see the town's historic murals in the downtown area. It features bed and breakfasts, antique shops and an art center. 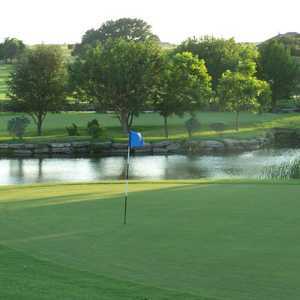 Where to Stay: The Cliffs Inn or The Cliffs Condos: The Cliffs Inn has rooms with a panoramic view of the cliffs and Possum Kingdom Lake. The Cliffs Resort has one-bedroom condominiums that sit directly on the course. Each condominium features a living room with sofa bed, dining area, kitchen stocked with cooking utensils and a bedroom with a queen-size bed. 888-THE CLIFFS or 888-843-2543 for reservations. Where to Dine: The Cliffs Restaurant serves great food enhanced by the views and breathtaking sunsets over Possum Kingdom Lake. The menu offers selections that include fresh seafood, aged beef, distinctive Southwest regional dishes and traditional fare. For a quick meal, The 19th Hole Grill & Deli at The Clubhouse has a selection of deli-style sandwiches, hot breakfast and lunch options and snacks and drinks for the golfer or guest on the go. Other Outdoor Activities: Rent a canoe for a trip down the Brazos River. The 20-mile section below the Morris Sheppard Dam is a scenic treasure of towering cliffs and limestone boulders speckled with nature and wildlife. There are no overnight campsites on the river, but numerous gravel bars can be used for overnighters. This is a popular adventure for the entire family. Fishing on Possum Kingdom Lake is a year-around winner. The clear, deepwater lake is stocked with large and smallmouth bass, striper, crappie and trout. The Cliffs' Ship Store will be happy to make arrangements for a fishing outing. The Graham city square has antiques, little shops and an old-fashioned drug store. Possum Kingdom Lake is the home of Scuba Point, a diving facility that houses the largest tank filled station in the state. They also offer certification courses. Scuba diving is only allowed within 150 feet of a shoreline. Directions: From Dallas-Fort Worth, take I-20 West. Exit 180 at Weatherford. Continue west through Mineral Wells and Palo Pinto to Brad. Take Highway 16 North. The Cliffs Resort is approximately 7.5 miles on the left. Origin of The Name: One story about why the lake is called Possum Kingdom began when a peddler named Ike Sablosky came to Texas in 1906. This salesman had come to Texas from Pennsylvania and Indiana to regain his health in Mineral Wells, which at that time, was famous as a health spa. While living in Mineral Wells, Ike saw an opportunity to get into the hide and fur business because the Palo Pinto Hills were a "kingdom" for raccoon, possum and fur-bearing animals. Sablosky's best source for possum hides came from cedar choppers and hunters, up in Northwest Palo Pinto County. Ike called his best suppliers, "the boys from Possum Kingdom." The name grew more and more popular and the area became known as Possum Kingdom. Sablosky moved to Dallas and became a millionaire in the insurance business and once owned Dallas' minor-league baseball team of the old Texas League. After his death at age 82, most of his wealth was given to charities.